Thai red curry recipe is made from using a special red curry paste, which is easily available in the supermarkets or any Asian stores. 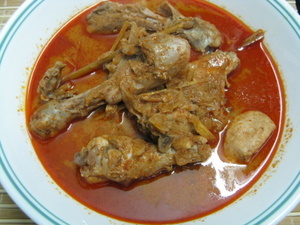 It is one of the most flavorsome of the Thai recipes. Although the ready made paste contains all the flavors but it is good to enhance those flavors by adding a few more fresh ingredients. In case a ready made paste is not available you can try making your own with the recipe given below. The ingredients required to make the curry paste are best not substituted, in order to get the best flavor. Alterations can lead to a different flavor altogether. Having said that I myself use normal fresh root ginger in place of galangal (which is also ginger but with a slightly different flavor. It is widely used in the oriental cooking). So use as many, ingredients that are easily available. Heat the oil in a non stick pan. Add the onion and ginger. Saute till the onions become soft and translucent. Now add the chicken pieces (3-4 pieces at a time). Keep stirring. When all the chicken pieces are sealed on top, add the red paste. Mix well. Add 1 cup hot water. Pound the lemon grass stalk and add with the chicken. This will help add more flavor to the curry. Sneak a taste and add shrimp paste and fish sauce as required. Cover the pan and cook till chicken is tender. Add the coconut milk and simmer for a few more minutes. Add more water if required. Taste again to add more shrimp paste or fish sauce if needed. Blend all the ingredients to a paste by using little coconut milk at a time. Sneak a taste and make adjustment if any. Carry on with the above recipe. 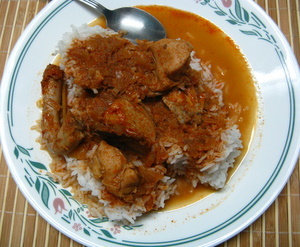 Enjoy the delicious Thai Red Curry Recipe! !